Potato Planting in Maine - An Epic Poem by Wilmont Ashby. GMO Labeling Law in Maine Closer to Reality. Study Cites Transgenic Bt as Toxic to Mice. Special Offer: FREE Organic Vegetable Seed. This edition of the Seed Piece can be found in our Seed Piece Archives. Waiting Patiently With High Hopes Ahead. Caleb was born in late June, so that meant he missed planting that first crop back in 1994. He was with us for ‘Digging’ (‘Harvest’ in Aroostook County) that Fall, though. Ever since that first year Caleb hasn’t missed one planting or Digging. Click here to see a National Geographic photo of Caleb and his first Fall Digging. Potato Planting in Maine - An Epic Poem by Wilmont Ashby. Fort Fairfield, Maine 1910. Each farmer is tilling his land. From dawn to the close of the day. Will nothing else grow on thy soil? To reward erring man for his toil? Must we hurry from springtime till autumn? Must we slave through the short winters day? Our horses, our eggs and our hay? For potatoes once planted must come. Some years, like the present, we’ve none. ‘Ere this craze for the dollar is done. ‘Twould supply all New England today. Sheep, grass seed, oats, butter and hay? Raising livestock, and poultry, and grain. Is the soul-stirring cry that we hear. It lasts till the close of the year. Or a top that was spun on the ground. While a shower of potato seeds flew. “Good mornin’, good taters, good mornin’. Before we can cut some more seed. “What’t that, wife, we’re all out of butter? Git along with molasses today. To git us some oats and baled hay. And cut all day long for dear life. “See! Mattie with gloves on By thunder! It’s enough for ter make a saint weep. Say! Where is that dratted lame Frenchman? In the haymow, I’ll bet, fast asleep. That that’s our hog there in the road. And give him a tunk on the snoot? Thar! He’s gone through the fence, the dern brute. Creation! Helen Blazes! Carrie Nation! I’d kill him as dead as a log. In goin’ to town ter git hay. What! Sunday! Ter-morrer ain’t Sunday? I’m so mad I could eat a dog raw. Don’t tell me they mustn’t eat straw. And when they play out, I’ll buy more. If I bust. every hoss on the farm. And hitch them steers out by the neck. If it raises a pound or a peck. And the market’s agoin’ to be grand. We were never so “bughouse” before. This year we shall try to raise more. What shall we beat next, who can tell? If we run the whole country to--well! But we’ll plant till the middle of June. No let-up for picnics or rain. Potato Planting on Wood Prairie Farm. Momentum is building nationwide for transparency in GMO food labeling. The State of Maine is moving forward with LD 718, the strong GMO Label bill which many believe has the potential to soon become the nation’s first GMO Label law. Last Tuesday, May 21, courageous members of the Legislature’s Joint Standing Committee of Agriculture, Conservation and Forestry (ACF) rejected a stealth amendment secretly inserted into the bill at the last minute by ‘Infant Formula’ manufacturers. Had the secret amendment not been removed, it would have created a giant exemption loophole which would have gutted the bill. In a dramatic show of solidarity, ten members of the thirteen-member ACF Committee, including both Co-Chairs, Senator Troy Jackson (D-Aroostook) and Representive Jim Dill (D-Old Town), threw their support behind the concept of GMO Labeling for Maine. The ACF Committee has voted out final language for LD 718 and has sent the bill to the House for a floor debate and vote. After that, LD 718 will proceed to the Senate. Legislative votes are expected within the next two weeks. We are potato farmers in Aroostook County and I can assure folks that, in fact, six varieties of Monsanto's GE potatoes - "New Leaf Potatoes" - were commercialized and supplied unlabeled to the American market for five or six years beginning in the mid-1990s. Monsanto’s New Leaf transgenic Bt potatoes had the Bt gene gene-spliced so that every cell of the potato - including the edible portion - expressed this bacterial toxin. It is a fact that the Maine Board of Pesticide Control required Monsanto to register their New Leaf potatoes themselves as a pesticide. No wonder Monsanto didn't want consumers to know the truth. The GE potatoes were eventually withdrawn from the market by Monsanto after pressure was placed on french fry manufacturers by McDonalds to cease using New Leaf potatoes in making french fries. As scientist Sally Fox explains, transgenic Bt is NOT the same as the foliar applied Bt used by organic farmers: "I ran the first greenhouse trial of an engineered Bt toxin for a small biotech company in the 80's. The greenhouse was sealed, the microbes killed to prevent any chance of escape into the wild. The toxin and it's activity lasted over 2 weeks. The normal crystal prototoxin, remains effective for maybe 24 hrs. If the EPA hadn't ruled it to be 'the same' as the crystal protoxin real toxicology work would have been required of any applicant. Studies on how or if it biodegrades, LD 50's on target and non target species..... were all bypassed by claiming it was a biological insecticide, when it was not. These protein toxins are nothing to joke about and the business people who overrode the scientists should be prosecuted for crimes against nature and humanity. They knew they were introducing a new protein toxin and to save money did not test it properly... The natural protoxin produced by the Bt bacteria is formed into a crystal structure that requires a pH of something over 10 to dissolve into toxin that is then available for action. The engineered toxins are truncated and available immediately, not only in the highly alkaline gut of an insect. It was insanity to release these and claim that they were the same as what the bacteria produces. Not insane actually, criminal, to be precise." State of Maine Official Motto: "Dirigo" (I lead). Maine is working hard to once again earn our state motto. No GE Potatoes Here. Of course, we would never sell - and have never sold - any Monsanto seed. The fact is Monsanto's GE Bt potatoes where chased from the market 10-12 years ago. Good riddence. Blockbuster Research Shows Genetically-Engineered Pesticide Plant Toxins Are In Fact Harmful to Mammals. This recent study represents a reversal of two decades worth of Biotech propaganda and misinformation. Transgenic Bt is NOT safe. "The study shows that the Bt toxins Cry1Aa, Cry1Ab, Cry1Ac, or Cry2A have toxic effects in the blood of mice. The methodology is not clearly described but what is clear is that the presumed nontoxicity of Bt toxin to mammals, on which all regulatory approvals of Bt crops are based, is false. In insects, Bt toxins exercise their toxic effects by breaking holes in the gut and rupturing the cells. In the mice in this experiment, Bt toxins caused red blood cells to rupture." Read more here. Quebec research reported two years ago indicated similar Bt toxins to be present in the blood of 93% of pregnant women and their fetuses. These two studies prove both the presence of transgenic Bt in humans and now the transgenic Bt's toxicity to mammals. This is a major development. Click here for our Wood Prairie Farm Organic Seed Potatoes. John Muir, Scottish survivor of the Irish Potato Famine. Legendary American preservationist and out-of-the-box thinker ahead of his time. Heavenly Maple Nut Squares. Photo by Angela Wotton. Recipe: Maple Nut Squares. Preheat oven to 350 degrees F. Line a 9-inch square baking pan with parchment, letting it extend up the sides. In a large bowl, stir together the flour, brown sugar and salt until blended. Using a pastry blender or two knives, cut the butter into the dry ingredients until the mixture forms large coarse crumbs. Press the crumb mixture into the bottom of the prepared pan. Bake the crust until the edges are lightly browned and the top feels firm when lightly touched, 12-17 minutes. Set aside. To make the filling, combine the butter, maple syrup, and brown sugar in a saucepan over medium heat and stir together until the butter melts and the sugar dissolves. Bring to a boil and boil for 1 minute. Remove from heat and immediately stir in the cream. Stir in pecans and pour hot filling over the crust, spreading it evenly to the edges. Bake until filling is set when you give the pan a gentle shake, 22-25 minutes. Transfer to a wire rack to let cool until firm before cutting into bars, about 1 1/2 hours. We talked to one customer in Western Maine today who wondered if there was still time to still plant potatoes. We told him, “yes, there’s plenty of time yet.” Years ago, one friend up here in short season Aroostook County didn’t get in his mid-season variety, Kennebec, planted until June 23. That year he grew and harvested a nice crop of Kennebecs. So you bet there’s still plenty of time yet. Fortunately, for you and us both, we still have lots of our organic Certified seed potatoes yet available and ready to ship. Varieties currently available include Yukon Gold, Dark Red Norland, Carola, Caribe’, Prairie Blush, Red Cloud, King Harry, German Butterball, Elba and Island Sunshine. If you haven’t yet planted your garden,we have excellent organic seed potatoes for you. Also, if you have finished planting and find yourself with a leftover corner patch or a leftover quarter acre, we can help you. Grow yourself a good crop for your family’s needs or to sell to neighbors in your community. Here's your chance to earn Four FREE Packets of Organic Vegetable Seed (Value $13.00) – Your Choice of Varieties - when your next order of organic Cerified Seed Potatoes totals $45 or more. Four FREE Packets of Organic Vegetable Seed - offer ends 11:59 PM on Tuesday, May 28, 2013, so better hurry! Please use Promo Code WPF1146. Your order and Four FREE Packets of Organic Vegetable Seed must ship by 5/31/13. Offer restricted to one packet per variety and may not be combined with other offers. Please call or click today! Click here for our Wood Prairie Farm Organic Vegetable Seed Section. German Variety Carola. High yielding and one of the best tasting potatoes anywhere. Our Mailbox: Saving Tomato Seed, Fighting For Fairness, Learning From Danes. Yes, and those are tomatoes worth protecting. Open-pollinated tomatoes are a relatively simple crop to grow and save the seed from - in addition to eating and enjoying the wonderful fruit. 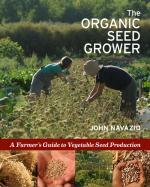 A recently published manual by our friend Dr. John Navazio, The Organic Seed Grower makes saving seed easier. As I was quoted on the back cover, "Dr. John Navazio has written the definitive book on organic vegetable seed production. This seminal work deserves a place in every grower's library. You can order The Organic Seed Grower from our farm store here. Thanks for all you do, Jim. I so appreciate your fighting for fairness, our food and our health. Thanks for your support. We have been farming organically for 37 years and we first learned 25 years ago about GE crops and the extreme threat they pose to the organic community. It's our job to fight for justice. The opening paragraph of the original brief in our OSGATA et al v. Monsanto lawsuit offers perspective: "Society stands on the precipice of forever being bound to transgenic agriculture and transgenic food. Coexistence between transgenic seed and organic seed is impossible because transgenic seed contaminates and eventually overcomes organic seed. History has already shown this, as soon after transgenic seed for canola was introduced, organic canola became virtually extinct as a result of transgenic seed contamination. Organic corn, soybean, cotton, sugar beet and alfalfa now face the safe fate, as transgenic seed has been released for each of those crops, too. And transgenic seed is being developed for many other crops, thus putting the future of all food, and indeed all agriculture, at stake." Spent Christmas in Copenhagen with my daughter and her family, and it is sort of interesting how easy it is to buy real food. Amazing winter markets. I remember when you went to Denmark on the Farmer Exchange. Talked to several vendors at the farmer's market. The one near my daughter's house is huge and heated with waste heat from the city public heating system. Our cosmetic grading standards go hand in hand with our anonymous disconnected commodity marketing system. That superficial system assures visual uniformity and mediocre quality. Farmers and the people benefit from the face-to-face connectedness that you describe in Copenhagen. The rewards are the REAL standards of quality: taste, freshness and nutrition. The Danes have much to teach us. Here's the link to our Seed Piece Newsletter article about the 35 danish dairy farmers who visited our farm back in July 2012, and another link to the article Megan and I wrote about one of our stops in our 2011 organic farm tour of Denmark.